he Velvet Underground’s White Light/White Heat is one of the most confrontational and inspirational second albums ever made by a rock band. Recorded in a matter of days at the end of the summer of 1967, a season in which everything seemed possible in rock and much of it happened at now-mythic speed, White Light/White Heat is an album that reeks of the gritty NY street life and could only have been made in New York, by one band. And that group is the classic-quartet lineup of The Velvet Underground – singer-guitarist Lou Reed; bassist-organist and viola player John Cale; guitarist-bassist Sterling Morrison; and drummer Maureen Tucker. 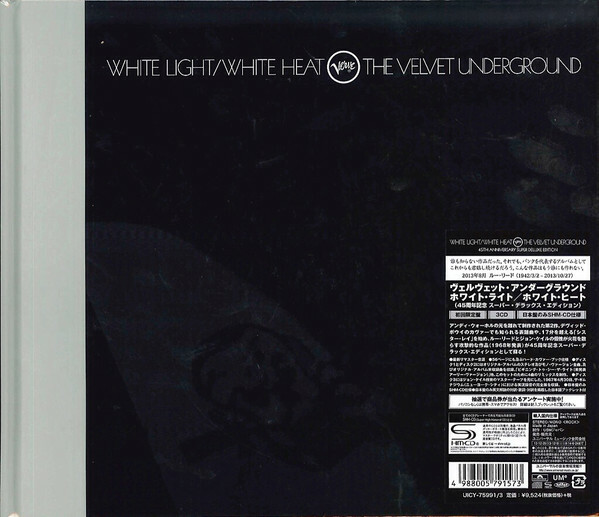 The Velvet Underground – White Light/White Heat 45th Anniversary Super Deluxe Edition, is a three-disc, 30-track set featuring both the original stereo and mono releases, completely remastered, with bonus tracks including alternate versions, unreleased outtakes, John Cale’s last studio sessions with the band, and the official release of their complete show at The Gymnasium in New York recorded on April 30, 1967, which includes five previously unreleased performances culled from John Cale’s personal copy. The Super Deluxe Edition includes four newly prepared remixes, including the earliest known, previously unreleased version of ‘Beginning To See The Light,’ and previously unreleased versions of ‘The Gift (vocal version)’ and ‘The Gift (instrumental version).’ Exclusive to this limited Super Deluxe Edition is a 56 page hard bound book with rare photos, memorabilia and David Fricke Essay/interview with John Cale and Lou Reed from 2013. The 45th anniversary editions were developed in conjunction with Lou Reed and John Cale.